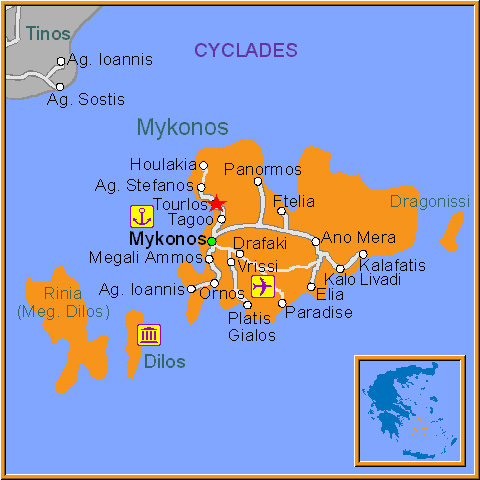 Tourlos is a small village about a 30 minutes walk from the main village Mykonos town. It's a quiet place with not many activities. This long and narrow stretch faces west and runs the entire lenghth of this extensive bay. Known in previous years more for its hotel development than its beach facilities this area is now the location of Mykonos' newly developed commercial port and public yacht harbour. Local bus and taxi service to the area is frequent. Food and refreshments are available at either end of the bay. Online Travel guide with the best accommodation in Tourlos. Find the cheapest hotels is Tourlos & get exclusive online deals. Great rooms at bargain prices. Book online now! Compare Hotel Prices and read Reviews from others. Great Hotel rates and information See photos, reviews & what's nearby Tourlos . Detailed tourist and travel information about hotels of Tourlos providing also regional information.